Mitt Romney’s family says he was reluctant to run in 2012. It was two weeks before Election Day when Mitt Romney’s political ­director signed a memo that all but ridiculed the notion that the Republican presidential nominee, with his “better ground game,” could lose the key state of Ohio or the election. The race is “unmistakably moving in Mitt Romney’s direction,” the memo said. These failures are now the subject of scrutiny by national GOP ­officials who say they plan to “reverse engineer” the ­Romney effort to understand what went wrong. A number of Romney’s top aides stressed in interviews that, while they ­remain proud of their work, they feel an obligation to ­acknowledge their numerous mistakes so lessons are learned. Republicans, as it happened, had lost track of their own winning formula. Democrats said they followed the trail blazed in 2004 by the Bush campaign which used an array of databases to “microtarget” voters and a sophis­ticated field organization to turn them out. Obama won in part by updating the GOP’s innovation. But losing seemed a remote and unlikely prospect when Romney gathered advisers in Boston and planned the campaign they all believed would put him in the White House. Romney’s inner circle of family and friends understood the candidate’s weakness all too well: He was a deeply private person, with an aversion to reveal­ing too much of himself to the public. They worried that unless the candidate opened up, he would too easily be ­reduced to caricature, as a calculating man of astounding wealth, a man unable to relate to average folks, a man whose Mormon faith put him outside the mainstream. Romney’s eldest son, Tagg, drew up a list of 12 people whose lives had been helped by his father in ways that were publicly unknown but had been deeply personal and significant, such as assisting a dying teenager in writing a will or quietly helping families in financial need. Such compelling ­vignettes would have been welcome material in almost any other campaign. But Romney’s strategists worried that stressing his personal side would backfire, and a rift opened ­between some in Romney’s circle and his strategists that lasted until the convention. More than being reticent, Romney was at first far from sold on a second presidential run. Haunted by his 2008 loss, he initially told his family he would not do it. While candidates often try to portray themselves as reluctant, Tagg insisted his father’s stance was genuine. Adding to the discomfort was Romney’s inability to persuade one of his most valued advisers to join the team. Mike Murphy, who had engineered Romney’s successful race for governor of Massachusetts, under­stood Romney like few others. While Murphy said he was flattered by Romney’s overture, he decided to remain in California, where he was working as a screenwriter and part-time political commentator. So Romney eventually picked as his strategist a man with whom Murphy had repeatedly clashed, Stuart Stevens. Stevens had helped guide the presidential campaigns of George W. Bush, but he was equally well known as an ­author and screenwriter. He had scripted episodes of “Northern Exposure” and told remarkable stories about himself, such as when he wrote in Outside magazine about taking “some of the banned performance-enhancing drugs that are often abused in the ­endurance sports I participate in, like cycling and cross-country skiing.” He seemed like an unusual match for the strait-laced Romney, but some felt that was precisely what the candidate needed. Stevens had clashed over the years with other campaign consultants, and sniping about his work from the outside came quickly. He had worked on Romney’s 2008 campaign, but had to share power with other advisers, an unworkable arrangement. This time, Romney promised Stevens and partner Russ Schriefer full control. Stevens wanted to keep the focus on Obama’s handling of the economy and what Romney would do to fix it. A candidate’s biography was of lesser importance. “When you come into a job interview, you don’t start showing family pictures,” ­Stevens said in a postelection interview. Family members kept pushing for a film or series of advertisements that would show how Romney had helped average people in personal ways, based on Tagg’s list of 12 people, along with clips about how Romney raised his family. The film project was to be overseen by documentary filmmaker Greg Whiteley, a longtime family friend who had been allowed to film portions of Romney’s 2008 campaign. But the plan was rejected, leading some in the family to blame Stevens. Stevens said he did not kill the documentary. But he said he did have a strategic vision that went another way, one he grounded in four questions he put to voters in focus groups. Romney made the final call: This was Stevens’ campaign to win or lose. And the outlook seemed bright. The veteran GOP pollster Romney hired, Neil Newhouse, found that only 20 percent of those surveyed thought the country was on the right track. President Obama’s strategy had very different roots. His national field director, Jeremy Bird, drew his inspiration from the time around 2001 when he witnessed, as a young Harvard Divinity student, a group of African-American students in a Roxbury church, pressing their case for school funding with members of the Boston City Council. It was a model, in miniature, of grass-roots engagement that would shape Bird’s career in politics and attract him to Obama, who had himself been a community organizer. Bird was confident that Obama would commit massive resources to building an organization that zeroed in on individual voters. It would be like that Roxbury church encounter, multiplied a thousand times. “I had watched a group of young people come together; I watched them organize at the local level,” Bird said. And Bird had learned another lesson. He lived in Massachusetts when Romney was elected governor, had studied him and voted against him, and was determined to do everything possible to prevent him from ­becoming president. So it was that Bird and his colleagues drew up plans to ­expand the electorate into one that could reelect Obama. In Ohio, for example, a “barber shop and beauty salon” strategy was designed to get likely Obama supporters, particularly African-Americans, to register to vote when they went for a haircut. “Faith captains” were assigned to churches to encourage parishioners to turn out for Obama. “Condo captains” were told to know every potential Obama voter in their building. The goal was like nothing seen in presidential politics: Each Obama worker would be ­responsible for about 50 voters in key precincts over the course of the campaign. By Election Day, that worker would know much about the lives of those 50 voters, including whether they had made it to the polls. Romney’s team talked about a ratio of thousands of voters per worker. It would prove to be a crucial difference. A first-class ground operation in 2012 required leading-edge technology, and here also an early gap opened between Obama and Romney. The goal was to create the political equivalent of a Facebook or Twitter, a platform that would change the way presidential campaigns are run. And Obama’s team found just the man for the job: a 34-year-old programming whiz named Harper Reed, who got his start as an 11-year-old pecking on an Apple II and had never held a top job in a political campaign. With his wildly flowing black hair, big earrings, and bigger glasses, he was not long on humil­ity — his website proclaimed that “I am pretty awesome” — but his talents were real. As Reed assembled his team, he insisted on being given leeway to hire some of the best techies in the country, from ­Facebook, Craigslist, Twitter. Moreover, he insisted the team be largely internal, rather than have the enterprise be divided up among outside consultants. The group was haunted by the failure of a similar venture in Obama’s 2008 campaign, when a get-out-the-vote computer program called Houdini crashed and could have cost the election if the race had been closer. This time, Reed and his team created a successor that they named Gordon, after the person who punched Houdini in the stomach shortly before the magician died. Separately, the Obama team created a system called ­Narwahl, named after an Arctic whale, which linked disparate computer programs together. Narwahl and Gordon would be tested repeatedly in exercises that Obama’s team called “game day.” Every imaginable failure would be thrown at the systems — hacker attacks, database meltdowns, Internet failures — and the team would be challenged to write up a manual for how to deal with each ­disaster. It was, they said, more fun than the fantasy war game Dungeons & Dragons. Zac Moffatt, Romney’s digital director, did not have the luxury of Reed’s time or ­resources. Moffatt came from the world of politics, had worked at the Republican ­National Committee and had long believed Romney would be the best GOP candidate for president. Moffatt’s team nonetheless managed to create big projects on short notice. For example, one of the highest priorities was a Facebook app that would ­enable the Romney campaign to locate voters who otherwise could not be found by telephone. By some estimates, half of younger voters do not have a landline or cannot be reached by cellphone. Three weeks before Election Day, the app was unveiled by the campaign and downloaded by 40,000 Romney supporters. There was only one problem. Months earlier, Obama’s campaign had developed a similar app, which had been downloaded by 1 million people. David Axelrod, Obama’s ­senior strategist, felt he had been given a gift. For months, he had worried that the Romney campaign would find a way to present its candidate in a compelling fashion. But as far as Axelrod could tell, the Romney campaign had no such strategy. “I questioned why they didn’t spend more time and ­energy early defining Romney in a fuller way so people could identify with him,” Axelrod said in a postelection interview. Axelrod jumped at the opening. In a major gamble, the Obama campaign moved $65 million in advertising money that had been budgeted for September and October into June, enabling the president to unleash a series of attacks that would define Romney at a time when the Republican would have little money to respond. deport,” and he said he had been a “severely conservative” governor, hurting his strategy to move to the middle for the general election. Beth Myers, one of ­Romney’s top advisers, had a nagging worry. Obama’s campaign was running ads in markets such as suburban Virginia designed to appeal to women voters. 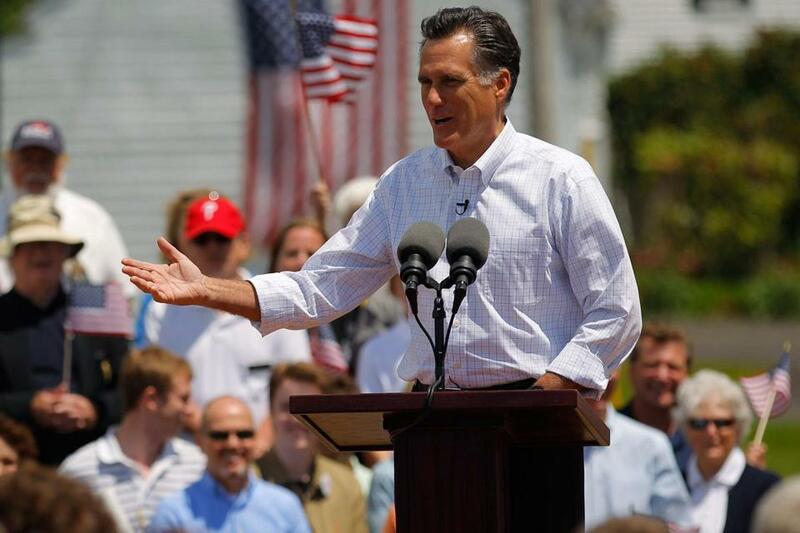 Myers wondered if the Romney campaign should ­invest in a direct response. That worry was a window into greater concerns about how the Romney campaign was handling its advertising money. In campaign postmortems, Republicans have been criticized for spending too much on advertising compared with Democrats, even as some ­reports said Obama was able to book television spots more cheaply, run more ads in key states, and reach key voters more effectively. The Obama campaign used a program called “the ­optimizer” that linked data from its voter databases, focus groups, and television ratings to determine how to reach people who do not typically see campaign ads. As a result, Obama purchased ads on channels such as TV Land and Hallmark that were watched by voters who rarely saw news programs where ads often appear. Stevens said the criticism of the Romney ad strategy is misguided. When advertising by the campaigns is compared, he said, Obama spent twice as much as Romney. In any case, as Romney continued to run negative ads, the pressure mounted from ­Romney’s family and friends to tell more about his life as the GOP convention approached. Ann Romney, who had long pushed for more focus on her husband’s personal story, made her point directly in a convention video: “If you really want to know how a person will operate, look at how they’ve lived their life.” A Vermont couple ­appeared on the convention stage to tell the emotional story of how Romney, as a Mormon leader, helped their dying 14-year-old son, David Oparowski, write his will. “How many men do you know would take the time out of their busy lives to visit a terminally ill 14-year-old and help him settle his affairs?” Pat Oparowski, the boy’s mother, said in her speech. But Romney’s campaign, still concerned about highlighting Mormonism and taking the focus away from the economy, arranged for the testimonial and an accompanying video to come before commercial television networks broadcast the proceedings. Instead, prime-time viewers saw Clint Eastwood pretending to talk to Obama in an empty chair. Shortly after Romney wrapped up the nomination, he stopped by for a conversation with Myers to discuss an idea that he believed would be the key to winning the presidency. He called it the Manhattan Project. Named after the government program to build the atomic bomb, the Manhattan Project was designed to turn a perceived weakness — Romney’s much-anticipated matchup with Obama in the fall debates — into the campaign’s greatest strength. So Romney proposed months of intense preparation, with 16 mock debates. (Obama did 11.) Then, just as Romney seemed ready, the campaign ­received news that a video had been leaked in which the candidate characterized 47 percent of Americans as “victims” who wanted government benefits and would never vote for him. That left the impression that Romney was referring not just to people on welfare but also to recipients of Social Security and veterans benefits. It seemed to confirm the worst view of ­Romney, that he didn’t care about average people. His poll numbers plummeted. If the Manhattan Project was ever needed, it was now. Obama played right into the strategy. After some lethargic rehearsals, in which Senator John F. Kerry of Massachusetts played the Romney role, Obama never mentioned the 47 percent controversy during the first debate. The president skipped at least two practice sessions at which he was going to review material. Obama seemed as unready as Romney was ready. “This was an exposure of Mitt Romney that people hadn’t seen before,” said ­Newhouse. “He had been a caricature who’d outsourced jobs, offshored jobs. The Mitt ­Romney they saw in debates was articulate, thoughtful, and had a plan.” Romney’s rating went up by 9 points in some key states, although that subsided as Obama performed strongly in the subsequent two debates. Romney’s aides were gleeful. They had — fortuitously, it now seemed — made a strategic ­decision to spend heavily on October advertising, the opposite of the Obama campaign’s ­approach. This surprised Axelrod, who questioned what he called Romney’s “backloaded” ad strategy, saying he could not think of a single effective ad in any presidential campaign that began airing after Labor Day. Tagg Romney could not figure it out. Why had Obama spent so heavily during the primaries when he had no primary opponent? Only later did Tagg realize this was a key to Obama’s victory. “We were looking at all the money they were spending in the primary and we were thinking ‘what are they spending all their money on? They’re wasting a lot of money.’ They weren’t. They were paying staffers in Florida” and elsewhere. If Romney’s Manhattan Project had been debate preparation, then Obama’s was the ground game. Building on its 2008 field organ­ization, Obama’s campaign had far more people on the ground, for longer periods, and backed by better data. In Florida, for example, the ­Romney campaign said it had fewer than 200 staff members on the ground, a huge commitment of its total of 500 nationwide. But the Obama campaign had 770 staff in Florida out of 3,000 or so nationwide. “They had more staff in Florida than we had in the country, and for longer,” said Romney adviser Ron Kaufman. Indeed, in swing state after swing state, the Obama field team was much bigger than the Romney troops. Obama had 123 offices in Ohio, compared with Romney’s 40. Obama had 59 offices in Colorado, compared with Romney’s 15, accord­ing to statistics compiled by the Obama campaign. Stevens said he expressed alarm about the Democrat’s early advantage in money and staff. He said Obama’s decision to reject public financing for the fall campaign (a move Romney followed) worked to Obama’s advantage ­because Obama used primary funds to prepare for the general election, and it meant there was no ceiling on how much could be spent. Romney’s confidence remained strong as Election Day approached. While public polls showed Obama in control, some of Romney’s internal polls showed him winning. Ohio was the greatest surprise of all. Romney pollster Neil Newhouse calculated that 209,000 more African-Americans voted this year than in 2008 in Ohio, while 329,000 fewer whites had voted. A key difference was the depth of voter contact. Romney took comfort in polls that showed voters had been contacted equally by both campaigns. But the polls were misleading, perhaps equating a recorded robocall on the phone with a house call by a worker. Kevin Madden, a longtime Romney confidant who served as a spokesman in the final months of the campaign, said that he regrets that the campaign did not adhere to what worked for Republicans in 2004, when George W. Bush won reelection with an innovative ground game. As dawn broke on Election Day, 800 Romney volunteers filled the floor of TD Garden in Boston. This was the centerpiece of the campaign’s turnout operation, code named ORCA, that was supposed to swallow Obama’s Narwhal program. But the Romney team was so determined to keep ORCA secret that it had never run a test at TD Garden; it had only gone through some lesser runs in a different building. The ORCA workers were supposed to be in contact with more than 30,000 volunteers stationed at polling places across the country. Those volunteers were told to bring a smartphone and go to a secure Web page on which they could report the names of everyone who voted. In this way, the Romney campaign could determine if supporters had failed to show up and urge them to vote. But as volunteers on Election Day began tapping in the names of voters, it became clear something was wrong. The system was so overloaded with incoming data from volunteers that it exceeded capacity and crashed. The Obama campaign, which had suffered a similar meltdown in 2008 and had been zealous about testing its systems this time around, had no glitches. Tens of thousands of Obama volunteers across the country sent real-time data from polling places, enabling workers at Chicago headquarters to ensure that expected vote totals were on track. More importantly, the field organization put in place by Jeremy Bird hit its goals, turning out the needed number of voters to reelect the president. As Romney’s campaign plane landed at Logan International Airport at around 6 p.m. on Election Day, he turned on his iPad and opened the Drudge Report. “Uh oh,” someone said upon seeing reports of early exit polls. But Romney still had hope. infamous appearance on Fox News Channel, insisting that his own network was wrong in calling Ohio for the president. Romney, who did not respond to an interview request, was ultimately responsible for his campaign’s failings. Republicans variously blamed factors such as a candidate who was too moderate or not moderate enough, a lower-than-expected turnout of white voters for Romney coupled with a heavy minority vote for Obama, and the president’s leadership during the Sandy storm. Inevitably, much of the blame has been directed at ­Stevens, and he hasn’t ducked it. “If there’s blame to be thrown, throw it my way,” he said. But he said it should be noted that Obama had no primary opponents, giving him an enormous advantage. In the coming months, ­Romney, ever the data-driven analyst, plans to contemplate how his political life came to an end, and what the party should do next, according to his son Tagg. The fight for the ideological soul of the party will play out for months. But recommendations are already pouring in for the party to create a ground-game infrastructure long before a nominee is selected, to catch up to the Democratic advantage in high-tech turnout operations, and to find ways to make the party more inclusive for minorities and women. Romney himself will make the case to the party for many such changes, according to Tagg. “Having been through it, you know so much more than when you haven’t,” Tagg said.